Jason Todd, the second Robin, has gone missing in search of his birth mother. 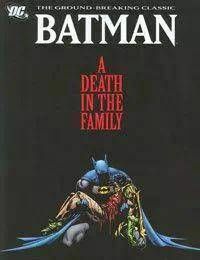 Forced to ignore the growing threat of the Joker, Batman must track down his missing apprentice and help him before it all becomes too late.Batman readers were all able to join a vote for Jason to live or for him to die by calling two 1-900 numbers between September 15-16 1988. Dial 1-(900) 720-2660 to vote for him to live or dial 1-(900) 720-2666 to vote for him to die when it was done the votes were 5,271 for him to live and 5,343 for him to die so writers listened to the readers and killed ROBIN! As the second person to assume the role of Batmans sidekick, Jason Todd had a completely different personality than the original Robin. Rash and prone to ignore Batmans instructions, Jason was always quick to act without regard to consequences. In this fatal instance, Robin ignores his mentors warnings when he attempts to take on the Joker by himself and pays the ultimate price: his life. Driven by anger with Superman by his side, Batman seeks his vengeance as he looks to get vengence on the Joker and make sure he never kills again.